"Unfinished Sympathy" is a song by English trip hop group Massive Attack, released under the temporary group name Massive. It was written by the three band members Robert "3D" Del Naja, Andrew "Mushroom" Vowles and Grant "Daddy G" Marshall, the song's vocalist Shara Nelson and the group's co-producer Jonathan "Jonny Dollar" Sharp. The song was released as the second single from the band's debut album Blue Lines, on the band's Wild Bunch label distributed through Circa Records on 11 February 1991. The choice of using the name "Massive" was done to avoid a radio ban as its release coincided with the Gulf War. Produced by Massive Attack and Dollar, the song incorporates various musical elements into its arrangement, including vocal and percussion samples, drum programming, and string orchestration by arranger Wil Malone. Upon release as a single, "Unfinished Sympathy" topped the Dutch Top 40 and became a top twenty hit on the singles charts of countries including Switzerland and the United Kingdom. The single was accompanied by a memorable music video, directed by Baillie Walsh, featuring a single continuous shot of Nelson walking through a Los Angeles neighbourhood, oblivious of her surroundings. Recognised as a pioneering song in the development of British dance music, "Unfinished Sympathy" was acclaimed by music critics for its distinctive production and Nelson's vocals. It ranked highly on several publications' year-end lists of the best singles of 1991, and has since featured in many polls of the best songs of all time of both music critics and the public worldwide. The song later appeared on the soundtrack to the 1993 film Sliver. Featuring vocals from Shara Nelson, the song utilizes a bell rhythm and various vocal and percussion samples. Nelson had known the members of Massive Attack when they were still part of the Bristol sound system collective The Wild Bunch, having been introduced to them by Adrian Sherwood, and had sung vocals on the Wild Bunch's 1986 single "The Look of Love". "Unfinished Sympathy" developed out of a song Nelson had been writing which she had provisionally titled "Kiss and Tell". Hearing Nelson singing the melody to herself in Bristol's Coach House studio during sessions for Blue Lines, the band and producer Dollar encouraged her to develop the song further – as band member 3D later recalled, "We thought, there's something there". The band, Dollar and Nelson worked on the song during a jam session in the studio, using a drum machine, keyboards and Nelson's vocals. It acquired its new name – a pun on Schubert's "Unfinished Symphony" – during this session. 3D explained, "I hate putting a title to anything without a theme, but with 'Unfinished Sympathy', we'd started with a jam... and added an orchestral score later. The title came up as a joke at first, but it fitted the song and the arrangements so perfectly, we just had to use it." The orchestral section was originally played on synthesizers, but as DJ Mushroom said, "The synth sounded too tacky, so we thought we may as well use real strings. The orchestra definitely changed the feeling of the song, making it heavier and deeper with more feeling. They were really good [but] it took them about five takes to do it because they were slightly behind the beat." It was Dollar's idea to use a full orchestra, and he contacted British music producer Wil Malone who arranged and conducted the song's string section which was recorded in Abbey Road Studios, London. However, as Mushroom later admitted, the group had not taken the cost of the orchestra into account when planning the budget for the recording of Blue Lines, and were forced to sell their car (a Mitsubishi Shogun) in order to pay for the strings. A trip hop song, "Unfinished Sympathy" incorporates drum programming and scratching performed by Mushroom into its arrangement; John Bush of AllMusic refers to these elements as references to the group's "b-boy past." The song's initial tone is set by "chilled hip hop beats" and samples of a percussion break from "Parade Strut (Instrumental)" by J. J. Johnson. Notably, the original album version of "Unfinished Sympathy" does not feature a traditional bass line. Vocal samples of a man singing "hey, hey, hey, hey..." – originating from John McLaughlin and the Mahavishnu Orchestra's "Planetary Citizen" – are present throughout the song. The music video for "Unfinished Sympathy", (a docu-fiction) was directed by Baillie Walsh, who had also directed the video for Massive Attack's previous single "Daydreaming", and was filmed in a single continuous shot from 1311 South New Hampshire Avenue to 2632 West Pico Boulevard in Los Angeles, California. The video, filmed on Steadicam, begins with a shot of a street gang before moving to follow Nelson walking along the pavement unaware or uncaring of her surroundings, which include drunks, bikers, and disabled people. As the video progresses, first Daddy G, then 3D (having finished making a call on a public phone booth) and then Mushroom (pushing a cart) can be seen walking several paces behind her, slightly out of focus. At the end of the video, Nelson walks past the camera and off down the road into the distance. The video was originally supposed to conclude with an overhead shot of Los Angeles, but the scene was ultimately scrapped. Not all the people featured in the video were actors: 3D told Melody Maker that "some of them were extras. And some of them couldn't be f***ed to get off the street. The gang at the beginning with the dog – they were real, they lived there." Performance artist Leigh Bowery served as the video's art director; the group later described him as "definitely the most outrageous character", recalling, "Because we weren't part of that London scene, he tried to dress down and go low-key around us. This basically meant he turned up to the shoot for 'Unfinished' in LA, dressed in this mental outfit, like a faux-Manc casual. Massive parka, a mad pudding-basin wig, big Stone Roses baggies, and dripping with sweat." Dan Kneece, best known for his work on the 1986 film Blue Velvet, operated the Steadicam for the video shoot. 3D said that Kneece was one of the main reasons why they had chosen to shoot the video in Los Angeles, "because there aren't many people [in the UK] who have the expertise to hold a Steadycam on their back for five minutes", the other reason being "the light, because you can't get that kind of golden light anywhere else". Kneece recalled that the shoot started with him on a Shotmaker arm on which he filmed the gang before being lifted into the air and then down again, at which point he had to take a running jump off the arm onto the sidewalk to follow Nelson. Six takes were recorded before Kneece became too exhausted to carry the camera any more. The equipment used for the filming included an Arriflex III camera, a Cooke triplet lens, and a 400-foot camera magazine. Precision speed control was used to fit the entirety of the song onto the camera roll. Sean O'Hagan of The Guardian described the clip as a "benchmark in modern video direction, more a breathtaking short film than a mere pop promo". English alternative rock band The Verve later paid homage to it in the video for their 1997 song "Bitter Sweet Symphony", which in turn was parodied in the video for the song "Vindaloo" by Fat Les. "Unfinished Sympathy" was released as the second single from Blue Lines on 11 February 1991. As the single was released in the midst of the Gulf War, the word "attack" was temporarily dropped from the group's name at the advice of their record company and management. The name "Massive Attack" had previously been deemed "unpatriotic" by the BBC – thus, the name change was carried out to prevent the single from being banned from airplay. The single was a commercial success for the group, managing to chart highly in several European countries. "Unfinished Sympathy" became a number-one hit on the Dutch Top 40 and peaked at number two on the Dutch Mega Single Top 100 chart. It also gave the group their first major hit in the United Kingdom, where it peaked at number thirteen and remained on the charts for nine weeks. The single reached the top ten in Switzerland and the top twenty in Germany and the Flanders region of Belgium. Outside of Europe, it peaked at number forty-eight in New Zealand. Upon its release the single received widespread critical acclaim from the music press. The NME made it single of the week and called it "an intense, warmblooded dance track that boasts more fire in its balls than the Pixies ever dug for" (referring to the Pixies' recently released single "Dig for Fire"). In Record Mirror, where it was also crowned single of the week, the review said, "The wisely understated production allows both the beauty of the swelling strings and the emotional pull of the vocals to shine through. Fiendishly expert with rhythms, too cerebral to be termed just a dance act, Massive can't put a foot wrong." Although it was not reviewed in Melody Maker at the time of its release, in December 1991 the magazine made "Unfinished Sympathy" its single of the year, stating that it "will unquestionably stand as one of the greatest soul records of all time". The song was also placed at number 8 in the NME critics' list of the singles of the year. Former Record Mirror writer and BBC Northern Ireland presenter Stuart Bailie stated that, "It was soul music. But it had bold, symphonic arrangements. It featured samples of the Mahavishnu Orchestra going 'hey, hey hey, hey'. It had funky breaks and an emotional power that was hard to figure. It sounded anxious and lost. But there was a grandeur in the music also. People who came across the record became obsessed, spinning it endlessly." The TV channel MTV2 in the UK ranked it #1 in a poll of the best songs of all time. Reviewer Julie Burchill has described it as her favourite song of all time. Mr. C of techno act The Shamen ranked it his number 1 song of the 1990s. Dance music producer Darren Tate has described it as his favourite record ever. According to Acclaimed Music, a site which uses statistics to numerically represent critical reception, "Unfinished Sympathy" is the fourth most well-received song of the 1990s, and the 50th of all time. Credits adapted from Blue Lines liner notes. Tina Turner covered the song on her 1996 album Wildest Dreams. Hooverphonic covered the song on their 2010 album The Night Before. The Six (featuring Jasmine Thompson) released a cover version in May 2015. It peaked at number 31 in Belgium. ^ "News". NME. London: 4. 2 February 1991. ^ a b c d Murphy, Colleen (28 May 2013). "Classic Album Sundays' Colleen Murphy listens to Unfinished Sympathy". Bowers & Wilkins. Retrieved 6 June 2013. ^ a b c True, Everett (13 April 1991). "Surrender to the Rhythm". Melody Maker. London: 44–45. ^ "The 100 Greatest Singles of All Time". Q. London (149): 27–58. February 1999. ^ "5. Blue Lines – Massive Attack". Select. London: 51. January 1992. ^ a b Robb, John (6 April 1991). "Wild at Heart". Sounds. London: 37. ^ a b Blue Lines (liner notes). Massive Attack. Wild Bunch Records/Virgin. 2012. WBRCDR1. ^ Bush, John. "Unfinished Sympathy – Massive Attack". AllMusic. Retrieved 6 June 2013. ^ a b c O'Hagan, Sean (2 February 2003). "The brand plays on". The Guardian. London. Retrieved 14 June 2006. ^ a b c Iqbal, Nosheen (6 February 2010). "Massive Attack's art of darkness". The Guardian. London. Retrieved 7 June 2013. ^ a b O'Hagan, Sean (28 October 2012). "Blue Lines: Massive Attack's blueprint for UK pop's future". The Guardian. London: Guardian Media Group. Retrieved 7 June 2013. ^ Collected (liner notes). Massive Attack. Virgin Records. 2006. CDVX 3017. ^ a b Kneece, Dan. "Massive Attack: 'Unfinished Sympathy', by Dan Kneece". SteadiShots.org. Retrieved 7 June 2013. ^ 100 Greatest Pop Videos. 4 Ventures Limited. 8 February 2005. ^ Ellen, Barbara (23 February 1991). "Singles". NME. London: 18. ^ Chong, Davydd (16 February 1991). "Singles". Record Mirror. London: 18. ^ "Singles of the Year". Melody Maker. London: 68. 21–28 December 1991. ^ "Singles of the Year". NME. London: 59. 21–28 December 1991. ^ "bbc - radio 2 - sold on song - song library - top 100 - number 44 - unfinished sympathy". BBC. April 2005. Retrieved 26 March 2010. ^ "Ultratop.be – Massive Attack – Unfinished Sympathy" (in Dutch). Ultratop 50. ^ "Offiziellecharts.de – Massive Attack – Unfinished Sympathy". GfK Entertainment Charts. Retrieved 26 January 2019. ^ "The Irish Charts – Search Results – Unfinished". Irish Singles Chart. ^ "Nederlandse Top 40 – week 14, 1991" (in Dutch). Dutch Top 40 Retrieved 26 January 2019. ^ "Dutchcharts.nl – Massive Attack – Unfinished Sympathy" (in Dutch). Single Top 100. ^ "Charts.nz – Massive Attack – Unfinished Sympathy". Top 40 Singles. ^ "Swedishcharts.com – Massive Attack – Unfinished Sympathy". Singles Top 100. ^ "Swisscharts.com – Massive Attack – Unfinished Sympathy". Swiss Singles Chart. ^ "Top 100 Singles - Jahrescharts 1991" (in German). GfK Entertainment. Retrieved 26 January 2019. ^ "Jaaroverzichten - Single 1991" (in Dutch). MegaCharts. Retrieved 26 January 2019. 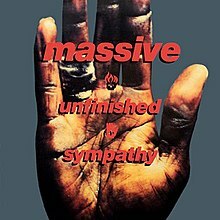 ^ "British single certifications – Massive Attack – Unfinished Sympathy". British Phonographic Industry. Retrieved 26 January 2019. Select singles in the Format field. Select Silver in the Certification field. Type Unfinished Sympathy in the "Search BPI Awards" field and then press Enter. This page was last edited on 15 March 2019, at 11:25 (UTC).